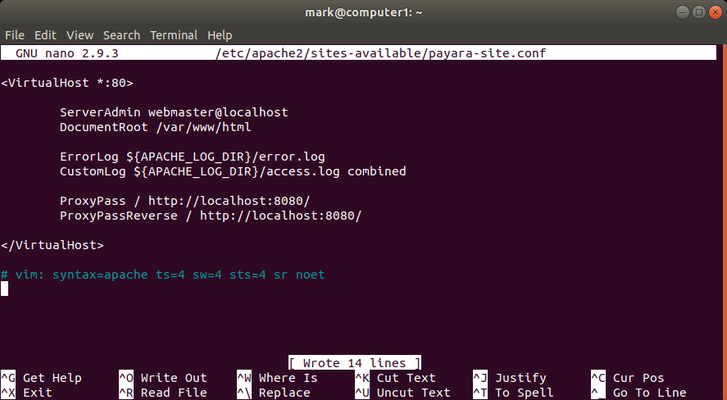 In this blog series, we will aim to give an overview of the basics of using Payara Server in a production scenario using Apache Web Server (sometimes called httpd) and Ubuntu. Many of the concepts described in these blogs do not rely on the tools we are using here and can be applied to other scenarios. Here we have an Apache web server which will be exposed to our users. Their requests will be forwarded to one of two Payara Server instances and we will use sticky sessions based on the JSESSIONID cookie to make sure each user interacts with the same Payara Server. We will also investigate session replication and prove that, if one Payara Server goes down, the other will be able to handle the existing sessions seamlessly. Note that prior to Ubuntu 16.04 you will need to use "apt-get" in place of "apt". If you wanted to disable a module, there is a companion tool to a2enmod called a2dismod which is used in the same way. The tool has detected the dependency and has also enabled mod_proxy. If you had a series of modules you wanted to activate you can add them after proxy_http, separated by single spaces. 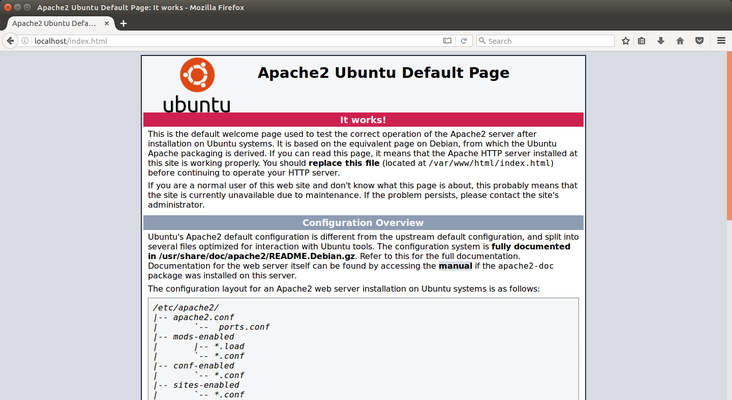 /etc/apache2/sites-available and is symlinked to the sites-enabled folder. This file is read, and its directives applied, from top to bottom, so if you have set the same property to two different values, the second will apply. (More accurately, the first will only apply until the second setting is read). This file can also specifically "include" files and folders (note that wildcards work too). These will be read in and merged with the main configuration at the point where the "include" statement is written. So the very last line in the main configuration file (if it is not specifying another file) will be the last line of configuration to be set, no matter what. We will not be using the default configuration because we will need to add in some specific behaviour. Copy the old configuration from sites-available and rename it something memorable. We need to add two lines within the <VirtualHost> tags to tell Apache how to deal with incoming and outgoing traffic - one to tell Apache where to send requests, and another to tell Apache where the responses should be seen to come from. So a user visiting http://localhost can be forwarded to our application server at http://localhost:8080/, and replies directed at http://localhost:8080/ instead get forwarded so the user sees them as coming from http://localhost. 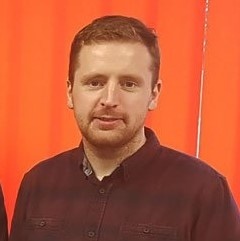 If you have any questions about this blog, or the Payara Platform in general, feel free to post a comment below. 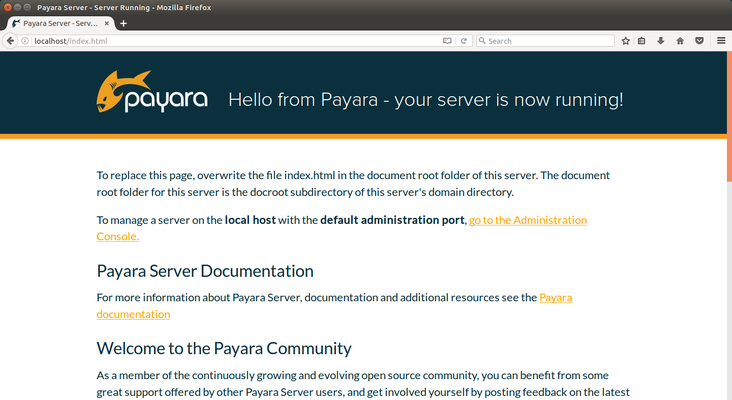 Not using the open source Payara Platform yet? Need help migrating to the Payara Platform?